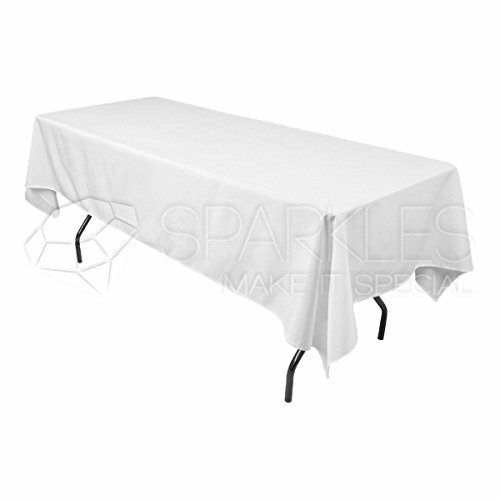 This is a 10 pack of brand-new polyester White 60″x102″ Rectangular linen tablecloths. Perfect for weddings, banquets, parties or restaurants. These are heavy, high-quality tablecloths – not economy versions. You and your guests will certainly feel the difference! 100% brand new, first run production. These tablecloths look great after one use or many. Each tablecloth is cut entirely from one piece of fabric, resulting in a seamless design. 100% polyester, stain and wrinkle resistant, with hemmed, piped edges. Sparkles Make It Special is a US-owned business. All of our inventory is in the U.S. and ships fast and free. We offer free shipping on your order, and if ordered by 5pm PT Monday through Friday, we strive to ship your order the same day. High Quality Premium White Polyester Tablecloths. Appropriate for rectangular tables sized 4′ to 6′. Each tablecloth measures 60″x102″. Each order includes 10 Tablecloths. 100% polyester, stain and wrinkle resistant, with elegant folded over hemmed, piped edges. Easy laundering in your home washing machine. Cut entirely from one piece of seamless fabric. Perfect for weddings, banquets, parties or restaurants. 100% brand new. These tablecloths look great after one use or many. Why rent when you can purchase our tablecloths for the same price! Class up your special event with Sparkles Make It Special polyester tablecloths and table linens.